I’ve been to Vancouver, B.C. so many times that I no longer feel the need to get out and explore in a big way. Instead, it’s become a place that I mostly hang out, return to favorite areas and try out just a few new things each time. This can lead to missing great places like Lumière but mostly it makes for a relaxing and free-flowing mini-vacation. One of my favorite neighborhoods in Vancouver is Yaletown. I think this is partially related to the fact that I’ve watched this area grow from a rundown warehouse district to the comfortable, interesting and (sometimes) edgy area it has become. Yaletown owes it’s birth to Expo 86. When the city began preparing for this World’s Fair they realized they needed to increase the number of rooms available for short-term lodging. There was a massive effort to clean up this area and turn many of the buildings into something that would provide adequate, clean and safe lodging for the thousands of visitors that were expect to attend Expo. At the time what was put in place were simply basic, fairly bare-bones rooms. Temporary hotels. But once Expo was over with so much work having already been done in the area the momentum continued. This area now has tons of little shops, all kinds of eateries and bars, and is home to some of the most expensive waterfront condos in the city. Quite a turn around over a period of barely 20 years. Early in the morning and late at night, however, the surrounding area retains its more unsavory characteristics. Each day on my early morning walks around the area the only people I’d meet on the street were the homeless and strung-out, some still wandering from the night before, others catching a bit of sleep before they moved their belongings to a more appropriate daytime location. During this most recent trip to Vancouver, Yaletown was a bit difficult to negotiate for a couple of days. Many of the roads in the area were blocked or restricted as they had become the track for a Grand Prix bike race that took place throughout the day on Saturday. So while I didn’t get to wander quite as freely as usual, I did get to spend some time watching the bike race while sipping a favorite beverage or nibbling a bite. Saturday around lunch time found me at Milestones, sipping sangria and munching on California Spring Salad and a cornbread muffin. 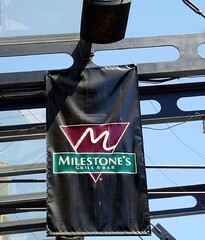 Milestones is part of a Canadian chain. In addition to Milestones restaurants they have several other concepts. I’ve been going to Milestones for years. In addition to this location in Yaletown, I’ve spent quite a lot of time at the one on Victoria’s Inner Harbour, the one at Whistler and occasionally they one in Kirkland, WA. What I like about this chain is that the menu is fairly large and diverse so it’s good when you are with people who have different tastes. The food is always reliable – good, fresh and carefully prepared. Nothing here is going to knock your socks off but everything I’ve had has been tasty. On this day I was looking for something refreshing as I was already warm with just the little walking I’d done to that point. Their California Spring Salad, which included strawberries, goat cheese and candied pecans, among other things was perfect. 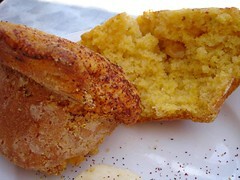 For a little more substance I ordered a spicy cornbread muffin – very good! And to accompany a light and refreshing beverage – sangria! Perfect. After Milestones I made my way down to one of the outdoor venues to watch a couple acts from the Jazzfest that was going on that weekend. This was a great event with venues all over the city: some inside, some out; some free, some paid; bands from all over the world. After a couple hours of listening to music and trying not to fry to a crisp in the beautiful sunshine it was back to Yaletown proper for a little sustenance. I had been hoping to stop at the Bluewater Grill, one of my all-time favorite places but I was a bit early. 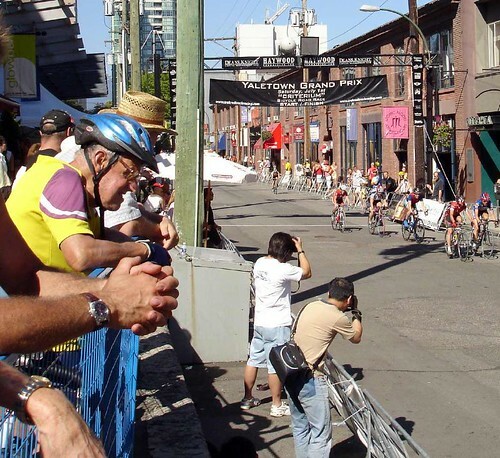 So, instead it was across to the Yaletown Brewing Company, who were actually sponsoring the Grand Prix. Yaletown Brewing is part of a line of brewpubs throughout British Columbia with most in the Vancouver area. It was one of the first places to move into Yaletown as it was transitioning to it’s new upscale personality. Yaletown Brewing serves mostly good basic bar food, brewed on site beers, and has a full bar. 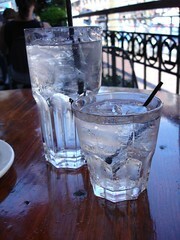 On this afternoon I just wanted a little nibble to go along with my oh-so-refreshing Gin and Tonic. I ordered one of my favorite Canadian bar snacks – Dry Ribs. 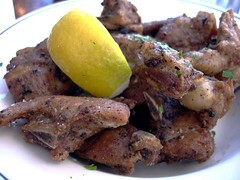 These are little pork ribs, cut into very small chunks, deep fried and then heavily, heavily salted and peppered. When they are done right they are the perfect combination of chewy pork, mouth-drying salt and pepper and overall crispiness – what could be better to go with beer or a cocktail, I ask you? I finished up, watched a few more bike races, then made my way back to my hotel room. Awesome! I\’ve been to Milestones in Boulder many times over the years. Good place right off Pearl Street. Brought back some memories for me. That\’s cool you saw a bike race. Always a good time. Your photos are fantastic. Are you diggin\’ this summer we\’re having or what? Sorry for such a delayed response… and that is partly due to the great summer! It\’s been pretty amazing. I\’m actually looking forward to the cooler weekend they say we are going to have – especially since it\’s going to turn right back around and be nice again. It sure is flying by – like summer always seems to…. Sounds like you are keeping pretty busy, too!